Trinity Lutheran Church offers Sunday School classes for children 3 years old through high school. Sunday School takes place at our school campus from 9:30-10:15 am each Sunday. Parents are encouraged to attend the Adult Bible Class which takes place at the same time. Childcare for children under 3 years old is offered for parents who would like to attend Adult Bible Class. 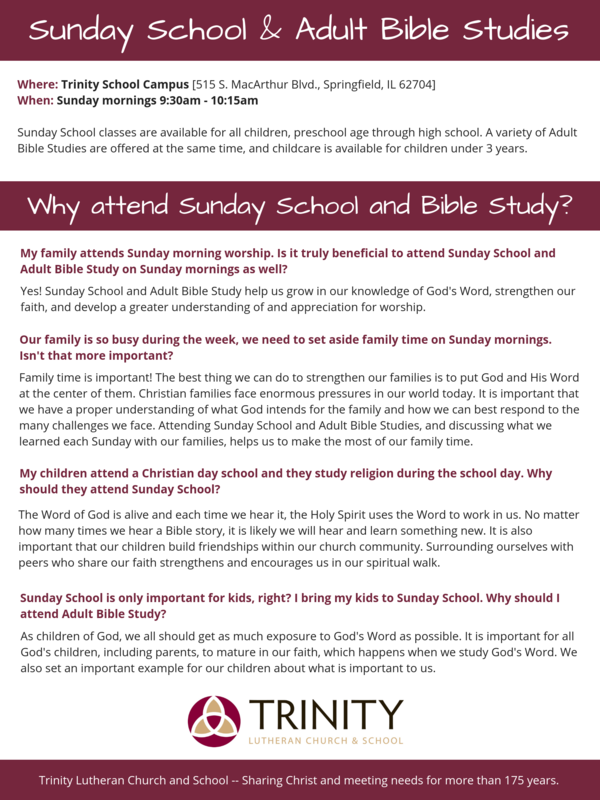 Wondering why you and your family should consider making Sunday School and Adult Bible Class part of your Sunday routine? Click here to find out! Trinity's Sunday School program uses the Growing in Christ curriculum, which follows a same-age classroom model so students learn and grow in faith alongside their peers. There they explore the Bible and learn more about God's plan for their earthly and eternal lives. Each week, every Sunday School grade level studies the same Bible story in age-appropriate ways. This allows families to discuss the Sunday School topic with children of every age. A family page is also sent home each week, giving parents the opportunity to read the lesson as it was presented and talk with their children about what they have learned.